Italian painter, originally Giovanni Andrea Donducci. He trained under the Carracci, most notably Lodovico, but he also responded to the more expressive art of Pietro Faccini and Annibale Castelli. The spontaneity and freedom of his Mystic Marriage of St Catherine (Rome, Galleria Spada) emphasizes his closeness to these painters, while his Assumption of the Virgin (Bologna, Pinacoteca Nazionale) is closer to Ludovico Carracci s style, though with overtones of a Mannerist elegance that is characteristic of Mastelletta. Annibale Carracci died in 1609, and after 1610 Mastelletta went to Rome, where he probably turned to the group of artists around Adam Elsheimer, Carlo Saraceni and Agostino Tassi, all of whom painted landscapes enlivened by small, vivid figures. Mastelletta s Crossing of the Red Sea, Moses Parting the Waters, Fête Champetre and Soldiers on the March (all Rome, Galleria Spada) are the stylistically mature product of this relationship, yet they also reveal his responsiveness to Emilian Mannerist painters, among them Parmigianino, Jacopo Zanguidi, Giovanni Bertoia and, in particular, Niccolò dell Abbate. In the same period Mastelletta painted 12 scenes from the Lives of Saints (Bologna, Pinacoteca Nazionale), probably to adorn a Franciscan church. These feature larger figures but still retain the Mannerist insubstantiality apparent in the works in the Galleria Spada. 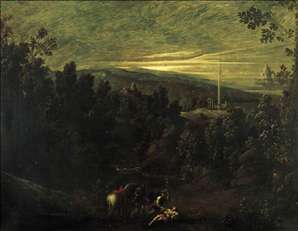 See more details about "Landscape with the Good Samaritan"